Bowen was a native of Georgia, who attended the University of Georgia before entering the U. S. Military Academy. 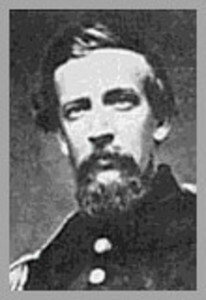 Graduating in the West Point class of 1853, Bowen served in the U. S. Cavalry on the frontier before returning to Georgia to begin a career as an architect. While stationed at Jefferson Barracks in 1855, Bowen met and married Mary Kennerly of a prominent St. Louis Southern family. Indeed, Mary’s aunt was the second wife of the explorer William Clark. The Bowens moved to St. Louis in 1857, and there John became active in the Missouri State Militia. At CampJackson as Chief of Staff to General David Frost, commanding the militia, Bowen was captured and paroled. He then fled south to begin a remarkable but abbreviated career as a Confederate warrior.